Young Richard was finding Reverend Talley's 'Holy Corpus' to be a most fascinating read as he perused its highly secretive contents. Nearly all of the narratives, passages, and verses written therein were quite perplexing. He couldn't comprehend a lot of it. Even so, he was utterly enthralled by the massive volume. One particular sentence was especially curious to him. It stood out from the general text in a strange, islolated way, and seemed to leap out from the page and grab his attention. It said: "Their seed still lingers and doth work the deeds of the elder lineage from the antideluvian era." He eagerly grabbed hold of his dictionary and looked up "Antideluvian." Then, he read the definition: "of the time before Noah's flood." That piqued his curiosity to an even greater degree. "Hmm," he murmered while rubbing his chin and furrowing his brow. At the same time, his piercing blue eyes became even more intense. This was obviously a divinely inspired work; full of magical formulas, mysterious allegories, and intiguing lore! There was also beautiful poetry, brilliant parables, arcane dogma, and esoteric wisdom, galore. The Holy Corpus contained everything a metaphysical-minded individual could possibly want, and more... MUCH more! Richard Briggs was beyond captivated; he was beyond immersed in it. He was consumed (by) it. Indeed, 'The Holy Corpus' was turning out to be a mesmerizing study! Suddenly, an urge came upon him from out of the blue -- just like the morning he automatically wrote for the first time. Again, it was as if an inner voice was nudging, or commanding, him to do something. This time, the order was to re-inspect Reverend Talley's S.I.T. note. (The first automatic writing the good reverend had ever done.) So he turned to the binder's folder section and slid it out. It said the same thing, nothing more: "Don't listen to him! You did nothing wrong!" Then, impulsively, without forethought, he flipped the sheet over and looked at the other side of it. Startingly, there was a previously unnoticed sketch. It was simply, what appeared to be, an opened eye inside of a triangle or pyramid. And although it didn't seem to signify much, at least not for now, for some reason that odd little drawing "spoke" to him. Then, not knowing why, he felt compelled to get up, open the drawer and withdraw his own automatically written note. So he did just that! The front: "It was not your fault. Feel no guilt!" was the same. But, turning it over, he discovered, to his astonishment, that it bore the exact same symbol, drawn in the exact same way! It was like a carbob-copy replica of what he'd just seen (on Reverend Talley's note). "There's NO WAY I could have forgotten drawing that thing!!!" he said to himself, while staring at it with protruding eyes and holding the sheet up in his shaking hand. "This is unbelievable!!! How did it get on the paper?!?!?" Comparing the two drawings side by side one another, he reached the conclusion, confirming to himself, that they were identitical in size and design. They even seemed to emanate from the same ink. "How can this be??? Why is it a perfect match???" he asked himself. He was utterly bewildered! "How did it get on the paper and why does it match Reverend Talley's sketch to a tee???" he kept asking himself. These things were just "TOO weird"! As for the design itself, he knew it looked familiar, but he couldn't quite place where he'd seen it. Within ten seconds it came to him, and then he took a dollar bill out of his wallet in order to confirm it to himself. Yep, there -- on the back of it -- was that very same image! An overwhelming surge of mysticism seemed to rush through him like an electric current. He knew beyond a shadow of a doubt that there was profound spiritual meaning imbedded in Reverend Talley's 'Holy Corpus.' Indeed, there was a deep reservoir of otherworldly wisdom on the automatically written pages. And it was unmistakably clear that his pastor was under the influence of supernatural guidance. Now he was even more intrigued by the sacred Holy Corpus scriptures! On top of all this, he'd previously observed, upon comparison, that Reverend Talley's automatic writing and the furthered automatic writing that he, himself, had begun practicing was stylistically indistinguishable. A handwriting analysis would certainly declare that they both emanated from the same source [hand]. Everything combined -- all the inexplicable phenomena with all of the connecting dots and pieces of the puzzle fitting perfectly together -- was way beyond "weird"!!! Truth is golden and secrets are sacred; so sayeth I, your disembodied spirit guide, Mohazarek. Tis one unknown truth swirling in the very center of the fourth, and final, Earth-Plane Illumination spiral, which only the bravest few have sought. And even the sprites know not. Though there is a man alive today who is far greater than all the sages of yore. He is on par with the denziens of the Invisible Kingdom. Speculators say he is on the verge of unraveling the mystery, discovering the truth, and harboring the secret. He would possess nearly unlimited power by accomplishing this monumental, unprecedented feat. Figuratively speaking, the stars in the sky would be his to own! The only name he goeth by is 'The Leader' -- strange as it may seem to some. No description of him will suffice to adequately convey his honor and glory! Likened unto a Seraph amongst mortals, he is in being, and within an aura of white light he shines, and a doctrine of eternal liberation he preaches. One come a day the whole world will know of him. Nearly all shall marvel after him and follow his teachings. An age of spiritual enlightenment will ensue. That is, unless certain dark forces, who are fervently working against him on a continuous basis, get their way. Those unspeakable foes are in competition with him over the acquisition of the secret within the secret. Whoever learns it first, it is he who rules the world! On the next page was a veiled spirtiual lesson engrained in a short story entitled: "The Hidden Path to Light." Then, there came a little poem called "Epic of Everlight." "What does that mean," Richard mumbled to himself in the quiet solitude of his safe and secure apartment. That was one of the many poems he'd come upon, thus far, in the borrowed notebook. But this one baffled him more than all the others he'd read. It was so fascinating to him, and although he felt like he 'sort of' understood it, he yearned to absorb the full, complete meaning. He intuitively felt like, if he did, he'd obtain a spiritual treasure. Richard furrowed his brow and shook his head. The fact that most of the automatically written pages were quite abstruse was now starting to disappoint, discourage and frustrate him immensely. Before he undertook the study, he had expected to be reading plain and simple language, not riddles galore! But as time went on, he became accustomed to the peculiar jargon. And it grew on him to the point that he greatly enjoyed it. Now, however, he felt like all he was getting was conundrum after conundrum. And it was beginning to vex him. Upon turning the page, he took keen interest in the symbol sketched on it. 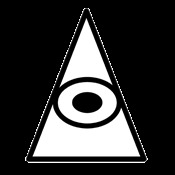 At first glance, it appeared as if the pyramid/eye design had reappeared, but it differed somewhat from the other figures on the automatically written notes. A sun with little lines of rays of light hovered above a leveled-off peak, and "PROM" was printed right under the pyramid's base. Perhaps, he thought, it yielded a clue as to the poem's significance. He presumed that it, too, was automatically drawn and he wanted to verify it with the author-turned-artist of the script. While sitting on the couch, Richard reached into his pants pocket, pulled out his cell phone and dialed Reverend Talley's number. "Hey, Reverend Talley. This is Richard." "Oh, hi, Richard," he exuberantly exclaimed. Richard's call had obviously given him a boost of cheerfulness. Everyone, including Richard, liked to be liked. "Are you busy, sir," Richard courteously inquired. "Well, I was just preparing next week's sermon but I'm suffering a terrible bout of writer's block. I'm glad you called because I need to take a break and clear my mind! What's up, Richard?" "Well, I've been reading through the Holy Corpus. It's engrossing, to say the least! The stuff you automatically wrote is real deep, which is cool... but hardly any of it is straightforward and direct, you know. I mean, it's not exactly composed of plain and simple language like I'm used to reading!" "Yeah, I know. That's the sheer beauty of God's mysterious ways; it's reflected -- his mysteiousness is reflected -- in his writing style. Is the complexity of it posing a problem for you, Richard?" "Well, somewhat. I think I just need your guidance. Do you have any advice on how I might be able to 'read through the lines', so to speak, and interpret it accurately??" "Just pray for perfect understanding and meditate on the meanings. You'll never comprehend it if you lean on your intellectual mind. Rely on your spiritual mind. Some of it will surely crystallize, but you'll never truly understand the majority of it. To be honest, I've only comprehended about five percent of the stuff I've written in my 22 notebooks. But that doesn't bother me in the least! I'm satisfied with just knowing that I have my very own canonical writings -- God's word written through me! If God wants me to understand more, he'll bestow it as a gift upon my mind! That's the way I see it! Like a personal tutor, he has already helped me with the five percent. I'm just thankful that I understand (that) much of it!" "Aah! I think that's a very positive, optimistic, and thankful attitude you have, Pastor! Hopefully, I can feed off of it and cease struggling so hard to ascertain everything! "Yes! All you need to do is just trust in God to let it come to you, and if he chooses not to reveal something to you, then that's for your own good, as well. "How about the drawing of a triangle with an eye in it and the sun above it?" "Oh, yes! That's interesting and very beautiful! What's your question concerning it, son?" "Did God guide your hand to draw it like he uses it write?" "Yes! Of course! God is also a great artist, isn't he?!" "I should say so! It's a gorgeous and mystical symbol! And although I don't think I understand the significance of it, merely looking at it made my spirit soar! It's incredible!!!" "I agree! I totally agree! I love gazing upon it, as well, and it has the same effect on my own spirit!" "What about the other triangle/eye drawing?" "Do you know, or have any idea, what 'PROM' means, or stands for?" "No, I haven't got a clue, unfortunately. But I'm pretty sure it stands for something other than 'promenade' or a high school prom because they wouldn't seem lofty enough for a message from God. "I suppose the drawing relates to the poem, 'Epic of Everlight', which precedes it." "Yes. That's clearly the case. The artwork is a visual representation of the poem. I'm sure of that!" "Do you have any idea as to the hidden meaning of the poem?" "I have prayed and meditated on it. I think that the basic principle of 'Epic of Everlight' is the triumph of knowledge over ignorance which leads to salvation. Jeusus said, 'Know the truth and the truth shall set you free.' But the poem is obviously much more complex than that. It is so complex, in fact, that you could say that there's a 500 page novel in those eight lines. That's what my intuition, stemming from God, told me. "Wow! That's a really interesting way of putting it! I like your analogy. It's sort of like a microchip storing a billion bits of information. I think that the poem is a warning of misery and, alternatively, a blueprint for bliss because..."
"Excuse me, Richard. My doorbell just rang. I'll call you back in a little while, okay?" Right after the conversation ended and Richard was returning his cell phone inside of his pants' pocket, his doorbell rang, as well. Through the peephole he spied two identical looking, pale faced men. Very pale! Each wore a black suit, old fashioned, black top hats, and their eye were totally concealed by heavily tinted sunglasses with thick, black frames. They also had thin lips and long chins. Odd looking characters, indeed! Most people would find them odd to the point of frightening. Far from a coward, Richard was much more curious than apprehensive! Therefore, he opened the door. In a flash, before he could say anything, he saw something raised at him. He was immediately shot with a TASER, and he fell backward on the floor. Then he heard the door close and knew they were inside his apartment. While on his back, he looked up and saw a handgun barrel pointing down at him from above. Then the other twin casually walked toward his disabled body. Lying there on the carpet, temporarily paralyzed from the TASER blast to the chest, he was rolled over on his stomach while the handgun remained pointed at him. Then, his arms were swung back and his wrists were handcuffed in the exact same manner he'd manhandled hoodlums in the not-so-distant past when he wore a badge. "Where's the notebook," one of them asked. His voice... that voice... undboutedly, something wasn't right about it. It sounded very sonorous and digitally distorted, like he was speaking through a vacuum tube and also a vocal alteration device that disguises people's voices on telephones and TV when they wish to remain annonymous. Also, a third aspect of it, was that it was akin to a cassette tape being replayed at a slower rotating speed than it was set on while in recording mode; his words seemed to drag out. His voice pretty much matched his face in sheer oddity. Richard was too shocked to respond. He was lying prone, face-down on the carpet, so, therefore, he couldn't see what the strange intruders were doing in his apartment, although he could very easily guess because he heard doors and drawers open and close and footsteps hurriedly come and go. He had no doubt that they were ransacking his apartment in search of the Holy Corpus. Reverend Talley had entrusted the precious notebook in his care and he was negligent in opening the door to total strangers. I should have been more careful, he thought, feeling tremendously regretful and entirely derelict in his duty to guard it with all his might. They kept rummaging through his belongings. "Where's the notebook???" was repeated in the same audibly bizarre manner. Richard was now too defiant to respond. Although he knew it was just a matter of time before they'd discover the borrowed treasure on the middle shelf in his bedroom closet. Twelve seconds later, his ears heard the disheartening words: "I FOUND IT!" The sentence was vocalized with a tinge of triumph inflecting the, otherwise totally bland, monotone. He thought, "Damn!!!" and gritted his teeth, as his heart sank. Then he felt a sharp needle entering the vein on the side of his neck. The penetration was deep and he knew he'd just been administered a knock-out drug. Hours late, Richard opened his eyes. He was lying on his couch with Greyman asleep on his chest. He'd regained consciousness. His hands were freed from the cuffs and his body was mobile. In a groggy, disoriented state, he looked around. Then, he recalled the entire episode: beginning with hearing the doorbell ring and seeing the pale twins in black through the peephole, up to the needle injection, and every nightmarish event in-between -- the absolute worst of which being the garbled announcement of the Holy Corpus's theft. Those three grossly distorted sounding words, "I found it," resounded in his head. It was almost too horrible to be true! He momentarily tried to convince himself that it was just a dream, but he knew that it was all too real. He had to accept the sad fact that those freakish bastards had actually stolen the priceless notebook. "Damn!!!" he said aloud, waking up the cat. As he hastily rose off the couch, Greyman leapt off his chest onto the floor. Then, he dashed to his wall phone and dialed 911. "Nine One One Emergency," the female dispatcher slurred nonchalantly. Her voice was evidently a reflection of the boredom she felt toward her job. "Two men broke into my apartment," Richard informed, in an urgently frenetic tone. "Then they assaulted me, drugged me, and robbed me. My name is Richard Briggs and my address is 407 12th Street, Apartment 5-A, Fort Lauderdale." "Are these intruders still in your apartment," she asked, maintaining her apathetically sluggish enunciation, which slightly annoyed the crime victim. "I don't know. They shot a drug into my neck. That's the last thing I remember. I don't know how long I've been unconscious. It could've been a matter of minutes or hours. But my guess is that has been a good while since it was probably a pretty powerful drug." "Okay. Officers will be at your apartment shortly." "Thank you, ma'am," he politely concluded -- despite her irritating voice. Merely four seconds after he hung up, the door was knocked on four times. He didn't expect it was the law because, although the dispatcher said they'd arrive shortly, he didn't imagine it'd be THAT soon! This time, the peephole revealed a couple of Asian cops standing outside. He considered that odd because when he was on the force, he didn't have any Asian co-workers... and he was acquainted with every Fort Lauderdale policeman. Must be brand new ones, he supposed. His next notion was that the Pale Twins had already been apprehended -- prior to his call; and they were at his door to get a description and a statement from him. An eyewitness probably observed the aggressive intrusion, he reasoned. Maybe his nosy neighbor in the apartment directly across from his, on the other side of the path-walk, was peering out of her peephole at that precise time. Or perhaps the informer was a passerby coming down the staircase from the upper floor who caught sight of something brandished, followed by a two-man rush into the interior of his apartment. That would have appeared extremely suspicious, in addition to their unusual appearances, and prompted a 911 notification from any responsible citizen. Richard optimistically opened the door. "We're responding to your 911 call," the one in front said, with a thick Eastern accent and a heavy drawl. Almost gook/hick combined. "My 911 call???" he echoed, astounded. "I just phoned it in a few seconds ago!!! How could you guys have possibly arrived here that fast???" Richard was astonished and eagerly wanted to know. But neither officer entertained his question. They simply stared at him with bleary eyes, sealed lips, and blank expressions. Five seconds of silence elapsed, but his bewilderment didn't subside. "Can you please tell me how you got here this quick??!!" he inquired again, this time in more of a demanding tone. Still, they offered no reply, just kept looking at him with those stone-cold poker faces. Realizing they weren't about to divulge the answer, Richard forfeited his attempt to receive an explanation for their flash arrival. Besides, the important thing to him now was that they HAD arrived! And, although befuddled, he had no complaints about their amazing promptness. "Come in," Richard invited, taken aback by their stoic demeanors; they displayed absolutely no emotion, inquisitiveness, nor assertiveness. This duo was nearly as strange as the other two. "Maybe this is just the way Asian people behave," he thought -- having not had many experiences with them on an individual basis. Richard was accustomed to being the authoritarian, 'take-charge-of-the-crisis' figurehead in this type of situation. His reversed role of 'victim' was anything but favorable! It was certainly no fun feeling violated and in need of assistance! And two unfamiliar cops with the personalities of morticians [or morticians' clients] didn't help matters! Once inside, the policemen didn't ask a single question. They just gazed at Richard with lackluster, inattentive eyes. It seemed as if they were waiting for him to initiate the account of the incident. Growing increasingly frustrated by their lack of loquaciousness, he tersely raised his voice at them: "Well, do you guys want to know what happened or not??!!" It was a vehemently redundant question. Again, neither officer reacted in the least, neither verbally or visually. Not even a head nod. Richard shook his head at them in flabbergasted disapproval. Then he commenced describing every detailed aspect of the atrocious crime. When he'd finished, the diminutive, slanty-eyed officers simultaneously turned their heads toward each another, and looked back again at Richard concurrently -- in perfect synchronization. Richard was to find that their flawless harmony was consistently habitual. In a monotone, Cho Lee slowly said, "There are no signs of forcible entry." That comment provoked indignation in Richard. He firmly and loudly clarified, "Didn't you hear me tell you that I OPENED the door for them??!!" They looked at one another, again in unison, and this time Fung Saki sluggishly remarked, "He claimed he was shot, but he has no wounds. And there are no blood stains on the carpet, furniture or walls." Cho Lee nodded his head as if he regarded it as a profound inference. Now Richard's waning tolerance was almost completely exhausted, as his anger escalated. With a raised voice, he berated the poker-faced, stiff-standing, slow-speaking oriental police officers: "Did you guys not understand anything I just told you??!! I SAID he shot me with a stun gun!! It was a STUN GUN!! A stun gun!! A -- stun -- gun!! Do I need to reemphasize the word 'stun' again??? Huh?! I'll repeat it one more time: 'STUN GUN.' Don't you know that stun guns do not cause external injuries?! Please pay attention to me!" They made eye contact with synchronized head motion again, and Fung Saki remarked, "He said his neck was stabbed with a knife, but it looks all right to me." Predictably, Cho Lee nodded in agreement. Richard was now boiling mad! "You idiots!!!" he screamed with vicious wrath. I can't believe you just said that!!! I told you a NEEDLE went in my neck, not a knife!!! Do you guys have severe cases of Attention Deficit Disorder, or are ya'll mentally retarded?! What is wrong with the two of you?! How in the heck did ya'll get your badges?? Talk about slipping through the cracks!! Must be kin to someone high up! Or maybe it was a case of gook-based affirmitive action. I'm gonna report both of you dimwitted buffoons to Captain Blackman! I want your badge numbers NOW!" Throughout Richard's diatribe, their phlegmatic expressions remained fixed on their sallow faces, which meant that they were apparently unaffected by the unmercifal scolding. This was just one more thing about them that confused Richard. Right after Richard demanded they provide their badge numbers, the telephone rang. Before he turned his back on the incredibly incompetent, intellectually challenged individuals, he said sternly, "I'm not through with the two of you! Start dusting for fingerprints... NOW!" he ordered. He aggressively grabbed the receiver and raised it to the side of his head. He was seething, and his "Hello" greeting reflected it; that one word was far from friendly sounding. "Richard, this is John Talley. I need to talk to you about something!" His voice was quivering, and Richard knew that trouble had arisen with him, as well. "What's wrong, Reverend???" asked Richard, sure that something was awry. "Richard, listen to me! Two strangers broke into my house. They came looking for my Holy Corpus. They found all 21 notebooks in my safe and stole them. I had the key hidden in an empty cereal box in my cupboard. After they left, I looked in the cereal box and the key was still in it, so I don't know HOW they opened the safe! I thought they were going to kill me for refusing to cough up my collection. At least I made them work some to get what they weren't rightfully entitled to possess! Listen Richard, I'm sure they know about you! They have ways of knowing things through supernatural means. They're not humans! They're... nevermind. Just be sure not to let anyone wearing a black suit into your apartment. I'm sure they'll come after the one remaining Holy Corpus notebook that they haven't acquired." "Reverend Talley," Richard cut in, "It's too late! They already came and took it. When you were on the phone with me earlier -- right after you said someone was at your door -- was when they knocked on my door. I guess it was their partners and they timed it that way so we couldn't alert one another." "Well, it could have been four different individuals, or it could have been the same ones. See, they're not restricted by time and space laws like us mortals." "Reverend, what are you talking about: 'us mortals,' 'they're not humans' and all this stuff. What are they???" "Richard, they're mentioned in the Bible and various other ancient texts around the world. I'd rather not get into that now. It's just too heavy! Listen, we're going to have to make a pact right now! If we want to keep our sanity, we'll need to agree to never discuss them again! That includes the Holy Corpus, as well. Thinking about our loss will drive us crazy! Try to put it all behind you. Trick your mind: tell yourself that none of this happened. Years from now it'll all seem like a dream. Do I have your word you won't mention any of this to me ever again?" "Richard!!" he sternly interrupted. "Give me your word!!" he insisted. "I promise," relented Richard, in a low toned, soft voice. Much different from his "Hello" at the inception of the call. "Very well! I'll see you at church next Sunday morning. And try to bring some peace-of-mind with you! "Okay, Reverend," he said calmly. "Goodbye, Richard. And God bless you!" Richard was very much shaken and having trouble mentally processing all that had just transpired; it was nearly too much for him. He slowly returned the receiver to its wall-mounted base, and then turned around. The Asian "cops" were gone. He wasn't surprised; for he realized that they, too, were not human beings. Then, he heard four knocks on his door. This time, through the peephole, he viewed his former colleagues, who also happened to be his close friends: Tyrell Maxwell and Phillip Barranger. After the door was opened, Tyrell said, in a deeply concerned tone, "Hey, buddy, are you all right?? They sent us out here saying that someone broke into your place and assaulted you." Richard had to think fast! "You know what happened, man... uh... this is embarrassing. I had a nightmare which I thought was real. Later on, after I called 911, I realized that it was just a dream. I'm really sorry I caused you guys so much trouble!" "That's all right, man," Tyrell said briskly, reassuringly. "I hate creating a false alarm," Richard reemphasized. Tyrell tried to assauge his buddy: "It was just a mistake. This is our job -- all in a day's work." "You didn't put us out any; just caused us to worry about you some, that's all." "I appreciate that, Ty," Richard said. "Just let us know if there's anything we can do to help you," Phil courteously offered. "Yeah, man! Don't hesitate to ask," Tyrell reaffirmed. He sincerely accented his words with the devotion of true friendship that was in his heart. "Thanks for the support, guys. It really means a lot to me. But I think I'll be all right," declined Richard. "Well, if you change your mind, feel free to call either one of us anytime," Tyrell persisted. Looking down abashedly, Richard nodded his head. "You've still got our home numbers, don't you," asked Phil. "Of course," Richard confirmed. "I'll be sure to keep in touch," he added. "All right, man. Take it easy, and remember that everyone makes mistakes," Tyrell consoled in closing. "Thanks again. Bye," Richard finally bid before shutting the door. He walked over to the couch and took a seat beside his curled-up cat. He realized that, absent Reverend Talley's telephone news brief, he would've told Officers Maxwell and Barranger a seemingly "tall-tell" about a prior arrival of two stupid Asian cops. They would've REALLY thought I was nuts, then, he thought! Perhaps that was precisely the intention of their visitation, he reasonably surmised. Meanwhile, Officers Maxwell and Barranger were strolling back to their squad car. Both of them were wholeheartedly worried about their friend's emotional well-being. Tyrell shook his head sympathetically and remarked, "Man, that's sad! It looks to me like Choirboy is on the verge of losing his mind!" Know-it-all Phil offered his analysis with the knowledge of a layman and the conviction of an expert: "I guess that typically happens to sensitive people after they kill someone. They can't forgive themselves. It haunts their psyches for the rest of their lives." "Yeah, I think he needs to see a psychiatrist," Tyrell naively opined. He was unaware of the dark irony!